See Setting Recognition Parameters for general recommendations on algorithm selection and parameter setup. 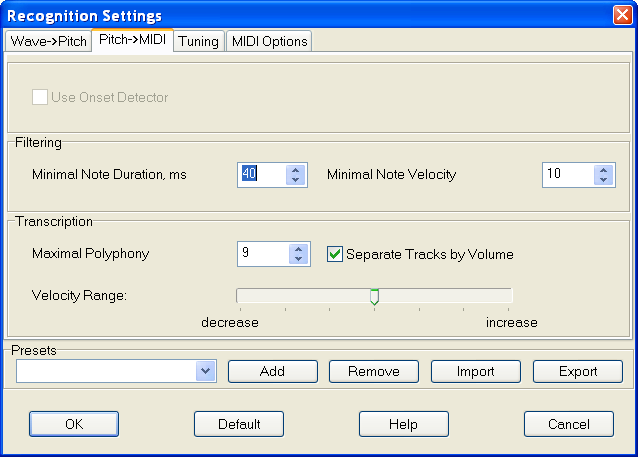 Minimal Note Duration - this parameter can help to discard short wrong notes from the resulting MIDI file. The algorithm simply deletes all of the notes shorter than this value. Appropriate value depends on the music genre; generally it lies in the range of 40..150 ms. Minimal Note Velocity - all notes quieter than this value (after applying Equalizer) are cut off. Maximal Polyphony selects the number of voices it the output file. Recognition result never contains more than "Maximal Polyphony" simultaneously sounding notes. Separate Tracks by Volume divides recognized notes into several tracks based on volume. Louder notes are placed on the track 1 and quieter on following tracks, allowing you to control polyphony effectively just by muting tracks. Velocity Range affects how notes velocity difference is transformed. If it is increased, loud notes will become even louder, and quiet notes become quieter. If this value is decreased, velocity difference in notes will decrease. This parameter is important, because changing note velocities may lead to additional note cutoff based on Minimal Note Velocity value, and so it affects numbers of notes in output. Usually there is no need to change this parameter strongly. MP3 to MIDI in detail | what is MIDI?